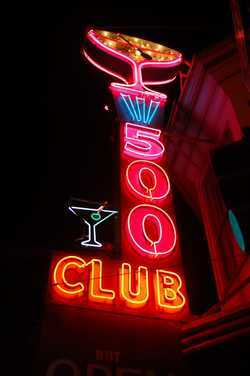 The fantastic 500 Club sign. Long may it bubble. Yelp photo by Nick S.
The Gangway. Yelp photo by Kevin Y. 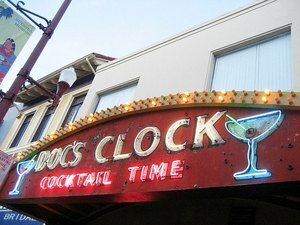 The iconic sign at Doc’s Clock. Photo via Facebook. It’s time to check in on some of our beloved dive bars, ever the endangered species. I have some bad news and some good news. Let’s dive in. SFist brings the disturbing news that the ~500 CLUB~, yes, she of the best sign in the city (that bubbling martini glass, I mean, come ON!) is up for sale. For $1.25 mil. Dear lord. Please have a cool person with a soul who happens to have access to that kind of money be the buyer. SFist brings up the fact that a new owner means they’d have to bring the bar up to code, which would mean some changes. We’ll just need to sit tight on this for now. So go enjoy a no-frills cocktail or a beer with some fun neighborhood folks (and their dogs) while you can. 500 Guerrero St. at 17th St., 415-861-2500. 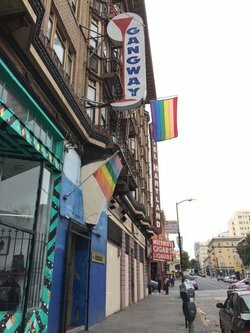 In other news, it looks like there’s someone circling ~THE GANGWAY~ again, SF’s oldest gay bar (since 1961, although the tatty bar dates back to 1910). Nooooooo. And let’s just say the potential new owner isn’t known for gay establishments. Quite the opposite: he’s one of the partners behind Kozy Kar. Yeah, the bar with the pervy van and water bed inside. Anyway, there’s ABC license transfer activity that lists Kung Fu Action Theatre & Laundry LLC (the owner is Sam Ruslender Young). I reached out to him, will have to see what’s the word. 841 Larkin St. at Geary, 415-776-6828. Okay, enough bad news, ugh. Here’s some good news: the ~ELBO ROOM~ has snagged a stay of execution and just gained a year on their current lease. Magic! They would now be able to stay in the current location until January 2019. Read this post on Hoodline for more. 647 Valencia St. at 17th St., 415-552-7788. And after that Leticia Luna (what is she, the female Les Natali?) booted ~DOC’S CLOCK~ from their location (she wouldn’t renew the lease), the bar has successfully moved and set up and is slinging drinks again at their new and very nearby address. Owner Carey Suckow brought over the liquor license, the bar, the jukebox, the pinball machine, and the shuffleboard game, and now has a 20-year lease on the new space. Boom. The fate of the iconic sign, however, remains in the balance. For now, you can look for the painted facsimile of the original sign on the storefront—it’s Cocktail Time! You can read more in this Hoodline post. 2417 Mission St. at 20th St., 415-824-3627.